I had a meeting today to sort through directions for one of the Audubon guide books I'm helping with--tedious, hard to stay focused work but I tried to set the goal of a varied thrush. One had been reported near the Audubon Offices in St. Paul so I thought I would go look for it when we finished the meeting. After the meeting, I drove over to the reported area and didn't see it. I stuck around about a half hour to forty-five minutes but no varied thrush. I suppose I could have lurked in the neighborhood longer but I've seen this species in San Francisco and didn't have to work that hard, I was getting hungry and decided to head home. However, it was not in a spot where I am allowed to park, bring out my scope and digiscope the bird without a stern talking to by airport security. I snapped one photo, rest assured that the lump on the corner of that building is indeed a snowy owl. The shape and size made me think "pigeon" but it seemed strange to see one of the neighborhood pigeons sitting out in the open and high in a tree at dusk. The traffic light was still red so I aimed my binos for a quick glance on the bird and could see that it was a small falcon. My friend Amber told me that she had seen a female kestrel the other day (in winter only the males tend to stick around in Minnesota). Curious, I drove around the block to get a view of the bird in better light--was this a female kestrel? Look at that huge malar stripe (vertical stripe under the eye). Also notice how the wing tips go all the way to the tip of the tail--that's no merlin, that's a peregrine falcon! This has to be the smallest male I have ever seen in my life (for non birders, in the raptor world, females are larger than males). Now, some of you may be wondering how on Earth could I mistake a merlin for a peregrine--aren't peregrines noticeably larger? Wouldn't that be obvious? Not always. 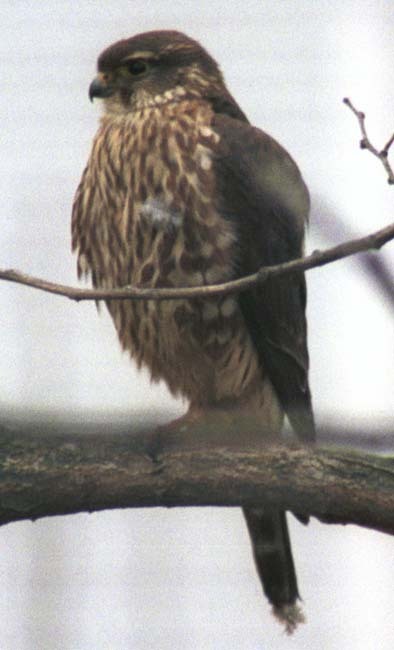 A female merlin can be 12 inches in length, a male peregrine falcon can be a small as 14 inches in length. I don't know about you, but I have trouble determining length at a distance--especially hashing out a couple of inches here and there. Also, this bird was out of context for me. Most of my peregrine falcon experience is seeing them on buildings or cliffs, not sitting perched on a branch in a tree. It didn't occur to me right away that a falcon perched in a tree could be a peregrine. I wish I hadn't been so hungry at the time I took these photos, I would have been curious to see the bands on his legs. No varied thrush but cool birds today. And a good lesson for me to pay more attention to what I'm focusing on in a view finder--not just making sure it's focused.